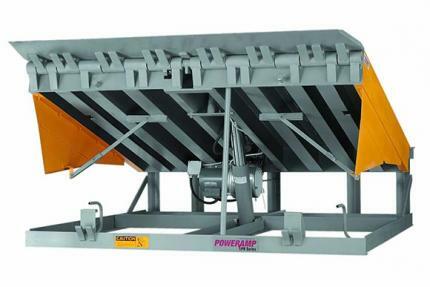 The PR Series Leveler features a 1.5 HP motor, mounted under the deck, and an access panel above the deck permitting easy adjustments and maintenance checks of fluid levels. Reliability is ensured due to the use of a patented fluid logic system for all leveler controls and operations, eliminating the need for electric solenoids that can fail, increasing maintenance costs. A unique safety feature of the PR Series Leveler is the bright yellow toe guards. The toe guards fold and lock into position, making them significantly stronger and more effective than sliding toe guards. Vertically stored levelers provide a barrier to entry for pests, and make cleaning easier; 2 important considerations for the food service industry. The vertically stored leveler provides a safety barrier between the dock doors and moving equipment reducing the risk of damage to dock doors. Maintenance crews can easily access all components of the leveler saving time and money during regular maintenance and operational checks. Air exchange through the dock door is greatly reduced compared to pit style levelers because the vertically stored leveler allows the dock door to seal the opening to the outside completely. This makes the VS Series dock leveler ideal for customers with food storage considerations, or where temperature controlled facilities are important.